If you do mockups of software interfaces, you might find this post of interest. Although I can write shell scripts and simple perl or ruby scripts well, I am not a developer. However, participating in a session with Pietro, a senior developer of the work management application ”Teamwork” from Open Labs, I found the Balsamiq application refreshingly easy to use. I was able to open Pietro’s Balsamiq file, add a few things, and submit it back to him for his comments. This exchange prompted me to see what kind of mockup applications were out there, despite of course being able to do mockups in Visio or Omni Graffle. Balsamiq is a cross-platform Java app that will run on your Windows, Mac or Linux machine, and which is focused on integration into wikis like XWiki or Confluence. Balsamiq mockups look like drawings, so your customers won’t get confused and think the software is going to be “done soon”. iPlotz is a cross-platform Flash app, with collaboration features. 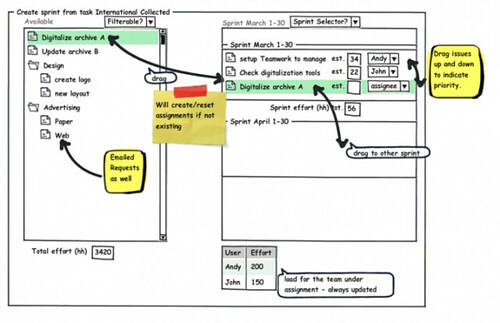 iPlotz mocks are more even sketch-like than those made in Balsamiq, and the collaboration part is a nice bonus. Mockup Screens is a Windows only app, so if you are in a shop that does Windows only, Mockup Screens might work for you. Personally, I prefer multi-platform, cross-platform everything. DabbleBoard is a general-purpose drawing app that has collaboration, but could probably be used for mockups as well. DabbleBoard not purpose built, though, but still is intriguing. Axure is also Windows only, but appears to have some very advanced features to allow fully-functional interactive mockups with collaboration. Axure is a bit more expensive compared to the other listed solutions, but seems to be pretty comprehensive. Thanks to Enda in the comments for the tip! That’s all for now but let me know if there is anything else out there. Enjoy!